Lattice-based signature schemes following the Goldreich–Goldwasser–Halevi (GGH) design have the unusual property that each signature leaks information on the signer’s secret key, but this does not necessarily imply that such schemes are insecure. 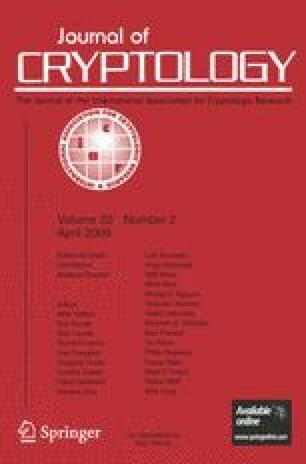 At Eurocrypt ’03, Szydlo proposed a potential attack by showing that the leakage reduces the key-recovery problem to that of distinguishing integral quadratic forms. He proposed a heuristic method to solve the latter problem, but it was unclear whether his method could attack real-life parameters of GGH and NTRUSign. Here, we propose an alternative method to attack signature schemes à la GGH by studying the following learning problem: given many random points uniformly distributed over an unknown n-dimensional parallelepiped, recover the parallelepiped or an approximation thereof. We transform this problem into a multivariate optimization problem that can provably be solved by a gradient descent. Our approach is very effective in practice: we present the first successful key-recovery experiments on NTRUSign-251 without perturbation, as proposed in half of the parameter choices in NTRU standards under consideration by IEEE P1363.1. Experimentally, 400 signatures are sufficient to recover the NTRUSign-251 secret key, thanks to symmetries in NTRU lattices. We are also able to recover the secret key in the signature analogue of all the GGH encryption challenges. P.Q. Nguyen part of this work is supported by the Commission of the European Communities through the IST program under contract IST-2002-507932 ECRYPT and by the French government through the X-Crypt RNRT project. O. Regev supported by the Binational Science Foundation, by the Israel Science Foundation, by the European Commission under the Integrated Project QAP funded by the IST directorate as Contract Number 015848, and by a European Research Council (ERC) Starting Grant.